Mayor Stoney has suddenly changed his mind and wants them removed. Back in the days of America's racist past, it was a common practice to cut up the hanging rope at a lynching and hand the pieces out to spectators as souvenirs. 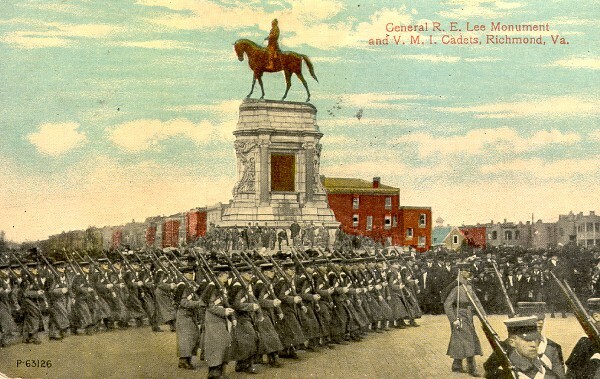 When the Confederate monuments were put up between 1890 and 1929 here in Richmond, the former capital of the Confederacy, one of the first was a 61-foot-tall statue of Robert E. Lee. Once it was up, they cut up the ropes that had been securing it during its construction and handed the pieces out to spectators. That memory’s long forgotten, and times have changed, but the statues remain on the city’s grandest boulevard, Monument Ave. Depending on who you ask, they serve as a grim—yet instructive—reminder of a sordid chapter of American history, a memorial to the brave men of the South who answered the call of duty, or a daily remembrance of a time when one’s ancestors were held and traded as chattel. While the swell of pride felt among so many Richmond residents when these imposing, avatars of bold, yet defeated soldiers were erected has now receded into more muted emotions, the open resistance to their symbolism is now acute. This long-simmering hot-button issue has heated up in Richmond in the past week, and every city that's chosen to let these controversial memorials, built in the Jim Crow years, remain standing is feeling tremendous pressure to take some sort of action. Mayor Levar Stoney, who’s black, seemingly alarmed by the display of hatred and racism in nearby Charlottesville, tweeted on August 16 that his office was looking into removing or relocating the statues. This was a rapid reversal, as earlier in the week he’d said, “I don't think removal of symbols does anything for telling the actual truth or changes the state and culture of racism in this country today." At that time, he was favoring adding “context” to the statues as an alternative to removing or relocating them. It’s no coincidence that most of the statues were erected either in the years following the Reconstruction or during the era of the Civil Rights Movement. The defiant message was that no matter what the federal government was doing, the descendants of slave owners were asserting their will to cling to a glorified, mythical past. In other words, black people had better realize they still had to stay in their place. 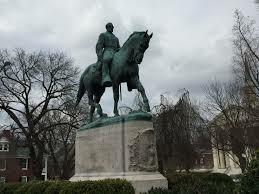 I remember when I’d just moved to Charlottesville and saw the striking statue of General Lee in the downtown park. It was a jarring experience for someone brought up in the northeast, where there're few symbolic representations of the Confederacy in public spaces. With all the progress that's been made on civil rights, it must be painful that their city won't take action to undo mistakes from the past. Some must wonder why they’re forced to pay taxes that go towards maintaining these intended affronts to their sensibilities. Those supporting the monuments being left in situ run the gamut from the torch-carrying white men who recently marched across the University of Virginia campus to those who want them removed immediately. In between, you have the many, like Mayor Stoney until a few days ago, who feel they should remain as a precautionary memento mori serving as a barrier to the sins of the past fading away into oblivion. Some of these “Remainers” may have had ancestors who died in the war at a time when there was a tremendous amount of racism in both the North and the South. They'd prefer that their departed relatives’ memories not be dishonored in a way that implicitly glosses over this distinction, and resist anything implying they should feel shame for the South's past. And then you have the straight-up racists, who nostalgically cling to the last great tangible symbol of better times. It's unclear why Mayor Stoney changed his mind after the events in Charlottesville, which only occurred because of a plan that's exactly like his brand new plan. Neo-Nazi Richard Spencer lives just two hours away in D.C., and he's certainly not going to just let it slide if Richmond decides to discard artifacts of the Confederate heritage that he speaks so proudly of. He'll have plenty of company too. A good guess is that Stoney's playing some canny politics. Soon-to-be ex-Governor of Virginia, Terry McAuliffe, and Ralph Northam, the Democratic Party’s gubernatorial nominee in a race that’ll be decided in November, have both come out for removing the Monument Ave. memorials. GOP nominee Ed Gillespie, who hasn't called for the removal of any memorials, will be isolated. In the wake of Donald Trump's widely-condemned remarks about Charlottesville and his subsequent defense of Confederate symbols as “beautiful,” being on the President's side on this issue is a political liability.